The end of the year is the time to begin evaluating the past 12 months and looking at ways to improve yourself. Our West Liberty and Muscatine IA dental offices are eager to help patients improve their oral health and achieve a better smile. Gentle Family Dentists prides itself on helping patients prevent major dental problems. And we also have a number of options for patients who need extensive dental work. Our office caters to everyone … patients of all ages and even those who have dental anxiety. Today we want to share a few tips you can use for a better smile. It’s typical for most dental insurance providers to reset dental dollars at the first of the year. And most providers also provider patients with dental free dental cleanings and exams a year. This is a great time to have your dentist review your smile and check for any abnormalities. We’ll also clean plaque off the teeth and then polish teeth to make it harder for harmful substances to stick to the teeth. 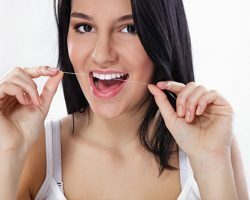 All dentists remind patients to brush their teeth twice a day and to floss daily. But there are a few ways to improve your brushing. First off, it’s recommended that patients brush their teeth for a total of two minutes at a time. You can check this with a timer, or if you have children, find special toothbrushes with a timer. It’s common for us to snack a little in the morning, afternoon, or evening. Some of us are more prone to snacking than others. The problem with snacking is that you’ll be creating more harmful substances in the mount, especially if you are choosing snacks filled with sugar. Healthy snacks include crunchy vegetables or fruits (carrots, celery, and apples), cheese (the calcium and protein are good for your teeth), and even nuts . Drinking plenty of water is good for your body and your oral health. Water keeps you hydrated and is the only liquid your body actually needs. Water keeps your mouth hydrated and helps flush dangerous food debris from your teeth and gums. If you’re in dental pain, you need to call a dentist as soon as possible. Whenever your teeth or gums are sore, something is wrong. Your teeth and gums should not hurt, so if you have discomfort, you should see your dentist immediately. Don’t let the problem linger. Early intervention is always cheaper than late detection. By visiting the dentist as soon as the problem arises, you’ll also likely have fewer dental problems down the road and you’re more likely to maintain the function of your natural smile. Call Gentle Family Dentists today at 563-288-2612 or use our online form to request an appointment in our Muscatine or West Liberty, IA dental office.